Girls: skirts no higher than two inches above the knee. Boys: shirts tucked in, no blue jeans or facial hair. This was my junior high dress code in Michigan, where skirts in winter meant knees red and frozen from the cold. My friends and I rallied for equality. If the boys could wear pants, the girls could, too, and while we were at it, that meant blue jeans. Times were changing and we pressed the issue. The principal threw out the dress code and from then on, it was “anything goes.” Girls wore pants or mini-skirts, and some boys grew moustaches. It was a radical change. This was my first foray into activism. Our victory was empowering and led to other actions. I sold an underground newspaper and protested the war in Vietnam. I wrote op-eds, voiced my position and never missed an election. I shouted slogans at women’s “Take Back the Night” rallies. Sometimes, it was enough to just show up and walk in solidarity. Change doesn’t happen by itself. The LGBT community has experienced amazing strides because people cared enough to show up. They cared enough to sign petitions, stand on a street corner with a sign and vote. They cared enough to contribute to their local LGBT center, to raise money for HIV research, or to help out an individual they knew. They volunteered. They examined their beliefs and reevaluated what was possible. They acted on what they felt was right and cried out for equality. It took time, but change came barreling down. I attended a rally over the Labor Day weekend–a festive celebration at the North County LGBT Resource Center in Oceanside, CA. Like “Thomas the Tank Engine,” the Center thinks of their group as the “little Center that could.” Located near Camp Pendleton in a predominantly Republican area, for years the Center struggled to maintain a presence in rented rooms. With continued support, they were able to obtain a dedicated space in a strip mall. The aforementioned celebration was to recognize the Center’s expansion into an adjoining space. The Center’s Director, Max Disposti, spoke to a sympathetic crowd about the many ways the Center serves the LGBT community. Through continued support from grants and donations, the Center provides a safe environment where youth and adults can avail themselves of needed social services. I was stunned to learn that up to 40% of the nation’s homeless youths identify as LGBT. I was heartened to know that straight teens also use the center for health care services not available elsewhere. One of our San Diego Supervisors, Dave Roberts, who is married to his partner, spoke next. He informed us of the challenges faced by the LGBT community, its relationship to local politics and the spotty support given by certain elected officials. His comments came at an interesting time in San Diego political history, as San Diego’s groping Mayor, Bob Filner, had moments before left his post, replaced by gay Councilman, Todd Gloria, who will now be Interim Mayor. This happened because courageous people came forward and revealed Mayor Filner’s atrocious behavior and history of sexual harassment, which led to his removal from office. If these individuals had stood on the sidelines, you can be sure the harassment would have continued. For years, San Diego and its metropolitan areas were entrenched in a straight-laced military environment; a Republican-infused stronghold that quashed much LGBT presence outside of the primarily gay neighborhood of Hillcrest. Now, members of the military frequent the Center’s services. Volunteers and a small staff work tirelessly because there is still much to be done, more people to reach, and truly, lives to be saved. On a shoestring budget, they serve 800 people every month. This is why I support my local center through membership and articles such as this one. It is why I sat and listened to speeches emphasizing how dedication and activism make a difference. And it is why I am telling you, if you aren’t sure what to do or how to make a difference, you can start by just showing up. Zoe Amos brings her lesbian point of view to articles and stories on diverse topics. Connect with her on Facebook and Twitter. “Superior” a novella, coming soon! Read her stories on Kindle and Nook. 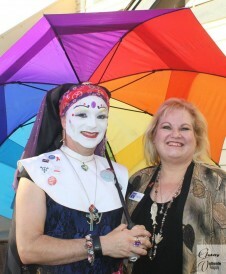 Check out her other life at www.janetfwilliams.com. Posted September 10th, 2013 & filed under Blogs. From A to Zoe: Come in! The door’s open. Great tribute to North County LGBT Center and Max!! I love reading your column sand short stories!! Thank you, Ramona! It is important for us to each contribute in our own way.